Digital 22, an inbound marketing agency, has increased turnover by 100% in each of its seven years in business. In 2018, the company has recruited 20 additional people to work at their office in Clitheroe. The company plans to recruit 35-40 people in 2019 in order to best serve their clients across the UK, Europe and the USA. After starting life as a typical, small-town digital marketing agency in 2011, Digital 22 chose to make the switch to exclusively offering inbound marketing services roughly four years ago. Since then, the company has gone from half a dozen employees in 2014, to 32 in November 2018, with another eight to be hired in the coming two months. The switch to inbound marketing (a form of marketing which attracts website visitors by offering helpful content) was after seeing the success of the marketing methods championed by a US marketing-software giant, HubSpot. Growth was accelerated when they niched into becoming a HubSpot-only agency, meaning they only work with clients who use the industry-leading marketing software. In doing so, the agency became one of the pioneers of the inbound marketing movement here in the UK. The end result is that they’ve become the biggest inbound marketing agency in the UK and one of the highest rated HubSpot partners in the world, of which there are thousands (they’re just outside the top 10 at the time of writing). This rapid and impressive growth has been built on offering an expert service whilst fostering positive working relationships, both internally and with clients. Those people in the Digital 22 team work in the recently renovated, Victorian-era Holmes Mill, Clitheroe. Having moved into the former mill 18 months ago, the company is expanding within the building in order to accommodate their upcoming hires. “The plan is to have a team of 60 in the new office, by this time next year. But the main thing, for us, is to not just help our clients but to also offer an amazing place to work,” added Mark. The company does this not just by offering the typical marketing agency perks - their office has a pool table, beer fridge and Xbox, for example - but also by investing as much interest in growing their employees as they do their clients. 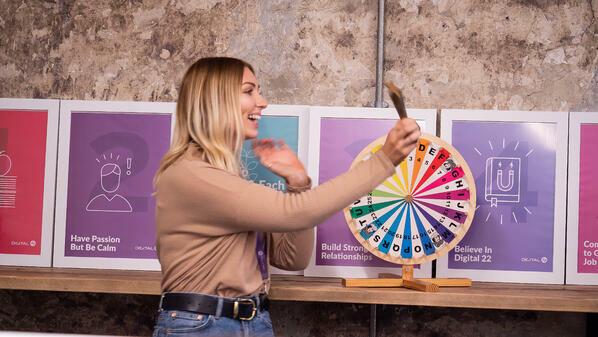 Employees vote for each other every month to win a spin on the prize wheel. Prizes range from a £500 bonus to an extra day's holiday. The company is always on the lookout for keen, talented people and you can see what roles are on offer on their website at www.digital22.com/careers.